In your garden, mint is the devil. Seventeen years ago, I planted one, tri-stemmed Chocolate Mint (Mentha x piperita) plant, and it invaded every bare inch of my herb garden, its runners leaping over edging and crawling under fences. I harvested as much mint as I could, but how many Mojitos can a gal drink? Then, I just yanked up the plants, trying to rid the garden of the aromatic but ruthless herb. The result? I’m still pulling mint growing from cracks in my garden’s retaining wall. Although mint is a headache, it’s hard to hate the herb. It’s a wonderful addition to drinks and salads, makes a tangy pesto to top chicken or fish, and fights tummy aches when steeped in water and drunk as a tea. 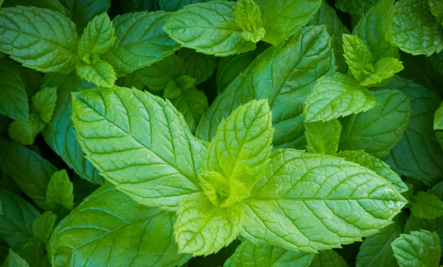 If you’ve got slightly moist soil and lots of sun, mint is easy to grow. But it’s hell to contain. Its rhizomes run underground and can send up shoots and new plants yards away from the original plant. Then, those shoots take root, and beget more mint. Before you can say, “julep,” the herb has taken root throughout your garden and, in my case, my neighbor’s yard. Don’t despair or vow never to grow mint. Here are some ways and places to grow mint so that it doesn’t take over. Many garden experts will tell you burying clay pots with mint will prevent it from spreading. Don’t believe it. The mint I’ve grown in pots laughs at the clay barrier, then sends its roots down and through the drainage hole. If you want to contain the plant in soil, you’ll have to plant it in something strong and deep, like an 18-inch long stove pipe or a terracotta chimney flue liner, which you can buy from a masonry supplier. Roots will have a harder time growing so deep and escaping such a sturdy container. If you want to grow mint in regular clay pots, set them on a deck or patio with clay or plastic saucers beneath. That way, when roots shoot out, they’ll have no ready supply of water or nutrients. The best way to win the mint war is not to wage battle in the first place. Take mint out of your garden and grow it as a ground cover under trees or on the edge of forests where it can roam free without bothering more delicate plants. Some folks even plant a mint lawn, which is sturdy, attractive and smells great. If containment or benign neglect don’t work, you’ll have to kill the plant to keep it from invading every part of your yard. The best way to do that without spraying toxins on your garden is to douse the plants with boiling water. Or, repeatedly spray plants with a solution of equal parts of horticultural vinegar and water, plus a squirt of dish soap. After several applications, the vinegar will desiccate the plant and, eventually, kill it. Could Kale Be Poisoning You? I have tasted spearmint that was more palatable. I did grow chocolate mint that my family gave me, but it only lasted for a season and it still tasted like mint...too much to hope for that it tasted like chocolate ð«... that would have been yummy. Mint is not the devil! There are truly noxious weeds that could deserve that name , but mint is merely an exuberant and useful plant.